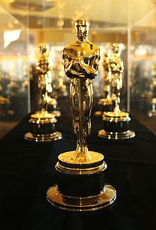 Award season > 91st Academy Awards – download your score sheet! Tonight is the big night — the 91st Academy Awards. If you’re excited to watch the ceremony, you might want to download and print out your very own Oscar score sheet so you can follow along and check off the winners as they’re announced. You can watch the opening ceremony as the stars walk the red carpet beginning at 5:30 p.m. on ABC and CTV. The Oscars start at 8:00 p.m. and are expected to end at 11:30 p.m.
As usual, your hardworking Tribute Showtimes team will be on the job, giving you live updates as highlights and winners are announced right here — and on Twitter. Paul Rudd, Michelle Yeoh, Awkwafina, Daniel Craig, Chris Evans, Tina Fey, Allison Janney, Brie Larson, Jennifer Lopez, Frances McDormand, Gary Oldman, Amy Poehler, Sam Rockwell, Maya Rudolph, Amandla Stenberg, Charlize Theron, Tessa Thompson, Constance Wu, Javier Bardem, Angela Bassett, Chadwick Boseman, Emilia Clarke, Laura Dern, Samuel L. Jackson, Stephan James, Keegan-Michael Key, KiKi Layne, James McAvoy, Melissa McCarthy, Jason Momoa and Sarah Paulson. Academy Awards 2019 live updates and winner’s list!